Do you need to replace your windows? Universal Windows Direct has plenty of affordable window designs and options that are custom engineered to fit your home's unique style. Our replacement windows will add beauty, quality and performance to your home and increase its value when the time comes to sell. In addition, our windows will help you save substantial money on your monthly energy bills, eventually paying for the cost of the project. With Universal Windows Direct, you can feel safe and assured knowing that all our products are backed by industry-leading warranties. At Universal Windows Direct, vinyl windows are the number one product for our customers. 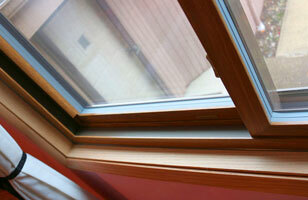 Our Energy Star rated windows provide the largest energy savings for your home. Our exclusive UniShield window packages feature SuperSpacer technology and our replacement windows not only look beautiful, but outperform the competition by reducing both the drafts in your home and your heating & cooling costs! Our products are custom designed on a job-by-job basis and range from simple to sophisticated. Choose from different glass packages, color options and grid patterns; our high-quality windows are custom made to fit your needs. Universal Windows Direct’s windows are installed by our expert installation team who provide the utmost care and precision, ensuring your windows fit the right way the first time. "Vince was an excellent representative for your company." "They did a great job, everything looks great. We really enjoy our new windows...."
Whether you're putting your home on the market or staying put for years to come, increasing the value of your home is a smart investment for any homeowner. When you increase the value of your home, you're also contributing to its appearance and energy-saving benefits, which can save time and money down the road. A siding installation company can help increase the value of your home with quality products - and you can find those products at Universal Windows Direct. 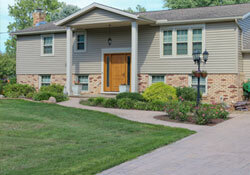 Siding companies can dramatically help improve the appearance of your home. If your current exterior siding is rotting, warping, or outdated, new vinyl siding will give your home a boost. The best companies will be able to offer a variety of colors and aesthetic features to choose from to further enhance your home. If you want your home to truly stand out, you can increase its value with vinyl siding enhancements such as scallops. You can find vinyl scallops that look just like hand-carved scallops from the Victorian era. Universal Windows Direct also offers vinyl cedar shakes that look just like real wood. This is a great option for homeowners who want the look of real cedar but don't want to hassle with maintenance throughout the years. Best of all, visitors won't ever be able to tell that it's not real wood. Increasing the value of your home goes beyond aesthetics. Universal Windows Direct's home siding can also help save money on your energy bills, and its structural integrity will last for years to come. Keep in mind that vinyl siding has one of the highest ROIs in the home improvement industry. Homeowners can expect to recoup up to 80% of its cost. Exterior doors serve several purposes for the home. They increase your curb appeal and give a focal point for the eye - especially if you upgrade to a door with a bright or bold color. Front doors can also help block out drafts and cut down on your energy bills, and they also offer a great return on investment. When you choose to upgrade your home with Universal Windows Direct, you'll be introduced to a wide range of replacement door options that will give your home a brand-new glow. Fiberglass is one of the best material options for doors. Fiberglass has reinforced skin that is resistant to dents, dings, and scratches. If you constantly use your front door, fiberglass is a great option since you won't have to worry about cosmetic blemishes. In addition to resistant skin, there are also a variety of paint and wood grain stain options available. 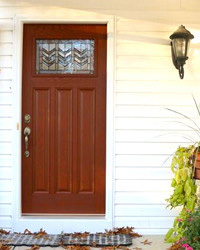 If you want the look of wood without the hassle, a new fiberglass door is a great option for you. Once you pick the perfect material, you'll also have the option to choose custom hardware to make your door completely unique. There are a variety of door handles to choose from in a variety of finishes. Don't forget that you can pick the perfect locking system to add more security to your front door, including our innovative touch pad lock that uses a passcode to enter your home. Other cosmetic options for your door include sidelites and transom windows. You can select decorative glass options, or use rain glass for the ultimate privacy. Don't settle for a subpar door from a big box home improvement store. Universal Windows Direct offers top quality replacement exterior doors for homeowners that last for years and boost curb appeal.